Stony Run Manor community is sold out and is not in active development by builder. If you are interested in Stony Run Manor or similar new home communities, contact us today! 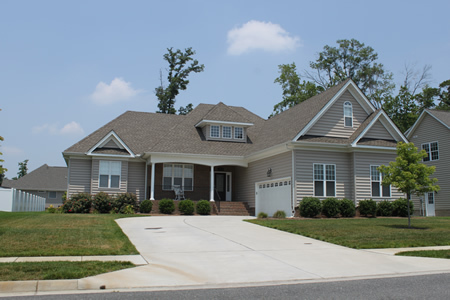 Our agents are very familiar with new and newer construction in Chesapeake, and can identify resale opportunities in Stony Run Manor, as well as builder inventory available in nearby or similar communities in Chesapeake. To view 8 more pictures, interactive maps and the full, detailed description of the Stony Run Manor community, please Login. Anyone can find new homes through the large array of properties in Stony Run Manor. These new construction homes offer modern amenities that homebuyers have come to expect in today’s marketplace. Tucked away into an exciting section of Chesapeake known as Greenbrier, this development is close to shopping, dining and entertainment. Military bases like Norfolk Naval Shipyard, NAS Oceana and Naval Medical Center Portsmouth are not too far either. The new construction homes in this development offer value and elegance with contemporary finishes. There are 51 properties to choose from so it won’t be hard to find new homes here. Each house in Stony Run Manor may feature a tray ceilings, granite countertops, architectural columns, hardwood flooring complete with stair treads, butler’s pantry, laundry room with built-in cabinetry, covered porch, natural gas heating, finished room over garage, two-car garage, pendant lighting, built-in bookcases, fireplace, stainless steel appliances, brick front, open floor plan, walk-in closets and more. For homebuyers wanting to be where all the action is, this is the part of Virginia to move to. Driving from these new construction homes to sprawling shopping centers is a breeze. Properties like Greenbrier Shopping Center, Greenbrier Village, Crossways Center and Greenbrier Mall house shops, movies and restaurants for afternoon fun. Chilled Ponds Ice and Turf Complex is for the active crowd ready to get those skates on. It’s nice to know homebuyers can find new homes near everything they could want in this metro area. Stony Run Manor is also in close proximity to natural pursuits like the Chesapeake Arboretum and Chesapeake City Park. When you’re ready to find new homes in an environment accessible to basically everything in Hampton Roads, check out this community. New construction homes like these offer security and sophistication in the perfect locale. If you think looking at Stony Run Manor properties is fun, just wait until you own one. Send me more information about communities similar to Stony Run Manor. Our agents gladly offer FREE property tours of Stony Run Manor, Chesapeake and homebuyer consultations to all serious buyers.